I have used a basic EVOD kit for the last 9 months, and it is still going strong with. It comes with 2 batteries, a basic clearomizer and a charger. Since then I have bought several more kits of other brands, but I have found the basic EVOD kit to be my favorite of the basic e-cig kits out there. Flavors taste good and it is reliable. You can buy cheap replacement coils at many websites and e-cigarette retailers. The EVOD allows for easy maintenance as well. For instance, burning the coils to clean gunk off the EVOD is easy. It is also not that hard to do EVOD rebuilds if you have the right equipment like kanthal wire, organic cotton and an OHM tester. 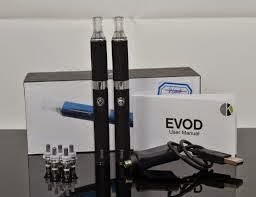 A downside to the basic EVOD clearomizer is that it is a plastic tank which means that certain liquids can cause it to crack, but most retailers will tell you if their e-liquid is known to crack glass tanks. Overall I would rate Kanger EVOD the best of the low price e-cig kits.